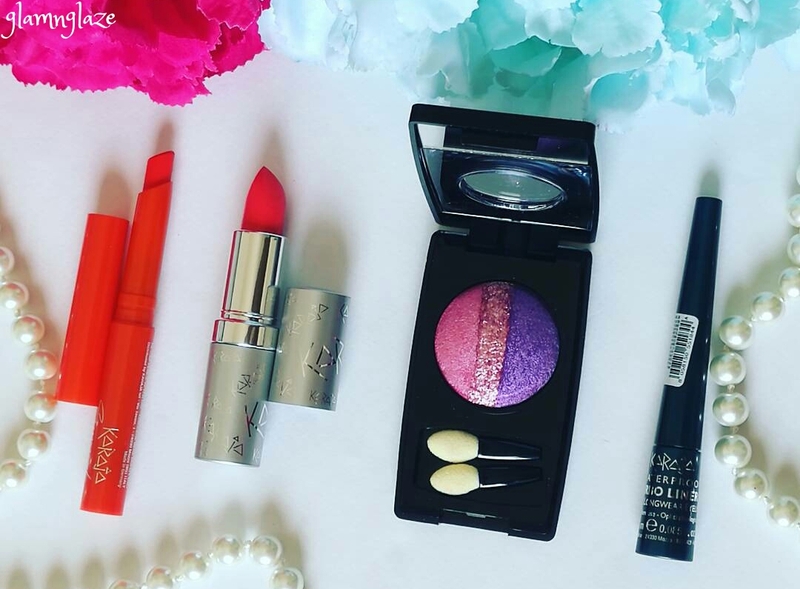 Today, I am going to share the details of a mini makeup haul.So,recently I had ordered few products online from www.lifestylestores.com. It's a great portal for online shopping.Be it cosmetics or home decors they have it all.I purchased few products which are from an Italian makeup brand called Karaja.Let's get started with the haul! 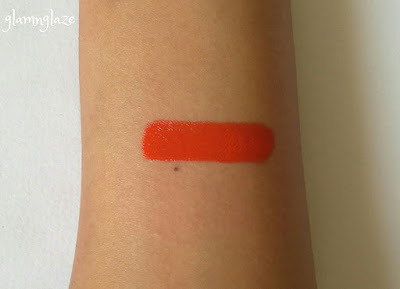 First product is a lipstick.It's from the Sensual Shine,shiny cream lipstick collection.It's an orange-coloured lipstick which is perfect to wear during the summer-season.The lipstick has a glossy finish which I like a lot.This lipstick is very pigmented and in one swipe we get full colour payoff.It feels very comfortable on the lips too.The lipstick comes in a colour-coded plastic tube with a pull-up cap.The colour of the tube matches the shade of the lipstick.Very handy feature in case we have more than one lipstick from the Sensual Shine collection. Nice quality,I am lovin' it. 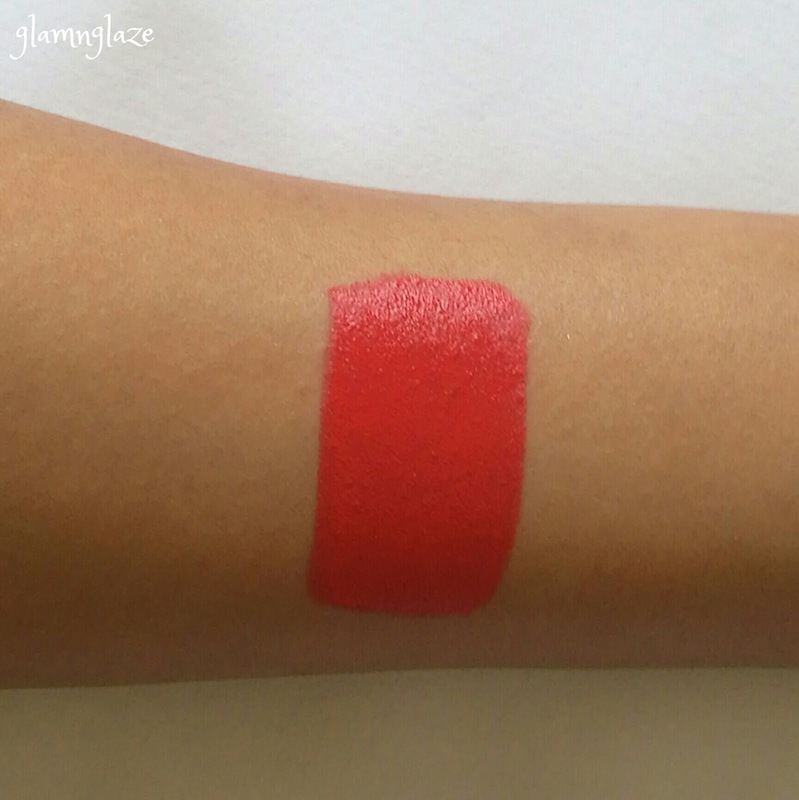 Lush, luminous lipstick. Waterproof, long lasting, glossy. 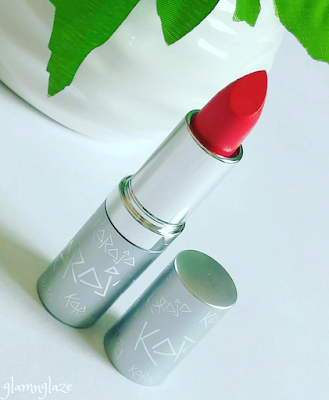 Soft and creamy it melts onto the lips with a velvety caress, giving a unique sensory expreience and unbeatable comfort. Close cap well after use. Dermatologically Tested. 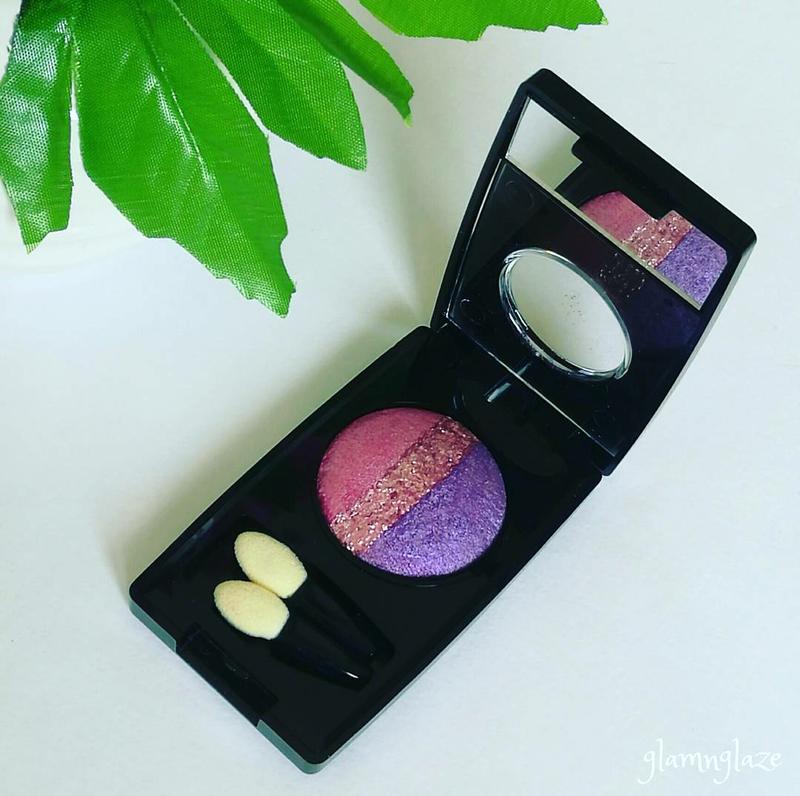 Third product is an eyeshadow trio in a uni-pan.It's from the Aqua Colour Eye Shadow collection.It is a beautiful combination of purple and pink with pink-glitters in tge middle-stripe.Attractive indeed!! 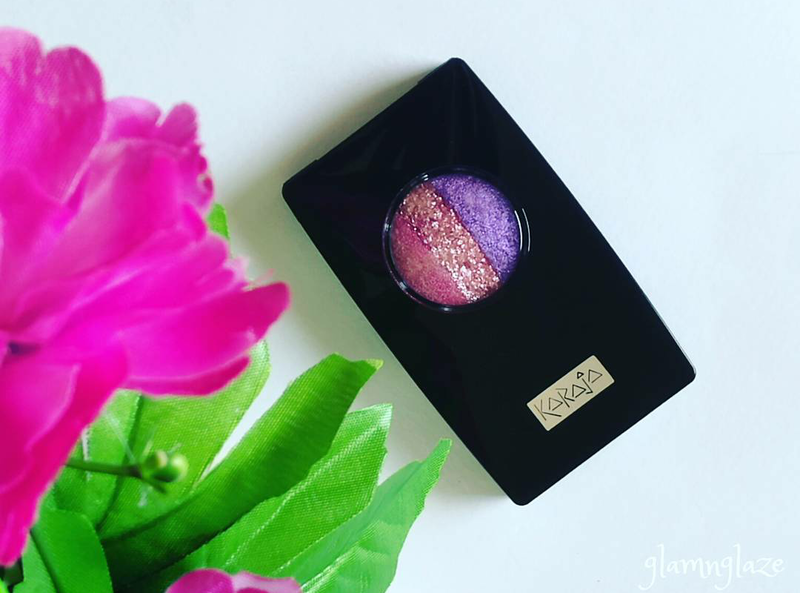 I had heard so many good things about Karaja-eyeshadows and wanted to try,that's why I purchased this product.There are other amazing variants available too.The shade range varies from the bold teals to warm neutrals. The packaging is lightweight and is made up of plastic.The eyeshadows can be seen easily through the transparent plastic-lid.The circular pan holds the product intact.The packaging is very sleek and compact.I am yet to try out these shadows.Will keep you updated on that.Do follow me on Instagram to get more updates on this product. Complete your statement look with this attractive eye-shadow.Powerfully pigmented,it gives you an intense look in an instant.Whether you want to keep it edgy or natural,this easy to blend shadow is suitable to create any style.Pastel eye-shadow with sparkling highlights.Can be used both dry and wet t intensify the iridescent effect. Last but not the least,I picked up a beautiful teal-green-coloured liquid eyeliner from the Turboliner collection.There are three shades available in this collection : purple,black,teal-green.The product comes in a conical jar which is made up of plastic.Jar has a twist-open conical cap.The packaging is sleek and very much travel-friendly.The product is of light teal blue shade and is of perfect consistency,exactly the way I like.It's nicely pigmented.Will try this product soon and let you know my thoughts.Please stay tuned! Flaunt a stylish look with this liquid eyeliner. 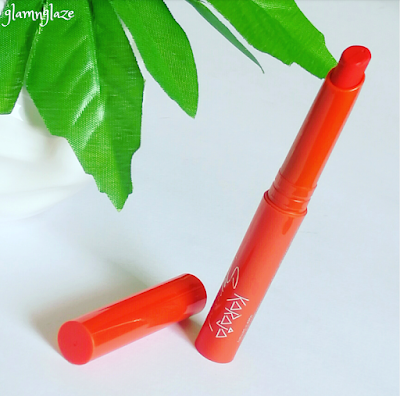 It comes with a sleek pointed brush to create a thin to thick defined lines for an awe-inspiring look. 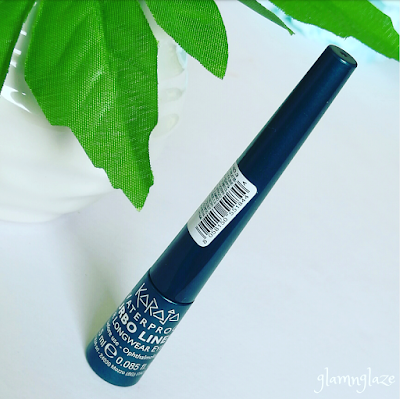 The liquid based formula does not stain and dries off quickly preventing folded lines on eyelids. In UAE, all the products(shown) are available @lifestylestores Lifestyle stores/online. Let me know if you would like me to review any of these.Also,which product did you like the most out of the products shown here?Do share. Have you tried products from Karaja,Italy? P.S. All the products shown here come in a classy silver-coloured cardboard packaging(outer),except the Turboliner(eyeliner).Love.